Nova appeared in two episodes of The Silver Surfer animated series. In his first appearance, he is one of a number of aliens aboard a starship. Along with Nova, his ally from The Man Called Nova comic book series known as The Comet makes a cameo! 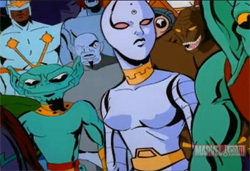 The group of aliens standing with Nova appear to be Nebula's crew who appear in the next episode. In Nova's second appearance, he is shown as a member of the space pirate Nebula's crew. The plot involved Nebula and the Silver Surfer racing to find the Universal Library of the Watcher. 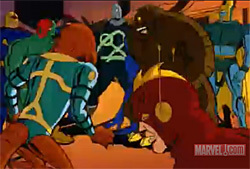 Although not directly shown in Part II, it is mentioned that Nebula's crew became part of a slug-like lifeform on the Watcher's homeworld. 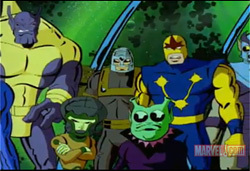 At the end of the episode, Nebula and her crew remained part of the lifeform. As a result of these brief appearances, a Nova action figure was created. To avoid confusion with Galactus's herald named Nova (Frankie Raye), who made frequent appearances on the show, the Richard Rider version of Nova was given the name of Supernova. A Nova Centurion appears in a single episode. The character is unnamed but he is one of the Wanderers. The Wanderers are the survivors of the worlds destroyed by Galactus. The plot involves the capture of the Silver Surfer by Gamora and the Wanderers. He is placed on trial for the actions of Galactus and his cosmic powers are removed. However, the device used to depower him also creates a black hole which threatens the Wanderers. The appearance of the Nova Centurion raises an interesting question. Does it mean that, in this animated version of the Marvel Universe, Xandar was destroyed by Galactus? Or did this Nova Corps consist of various races and only this particular Centurion's race was annihilated by the Silver Surfer's master?